RLH 409 Wed 9 Jan at 1pm. We are sure that her work will inspire an interesting discussion on Wednesday. even better, bring a friend! The engaging CQR lunchtime Go Create! Come prepared for informal conversation, sharing, and audience participation! The Centre for Qualitative Research welcomes new members and invites them to contribute to our on-going and successful Seminar Series in the coming Academic Year. Doctoral Students and Academics from across disciplines and Faculties are welcome to join CQR. You can become a Full Member, meaning your publications and research income will be counted through CQR, or you can be an Associate Member. You can be an Associate Member of several research centres at once. Doctoral students generally join the Centre where their First Supervisor is a member. One way to participate in the Centre is to give a presentation at one of our seminars. Information on how to do this follows. How have you used/are you using creative approaches in your qualitative research? Sign up now to share your experience in our well-attended CQR Seminar Series for the next Academic Year! Tell us how you might share your creative approach “in conversation” with CQR Seminar participants. This could be by sharing knowledge from a completed or on-going research project, or it could be a hands-on, participatory demonstration of a particular method. There are nine monthly 50 minute seminars (usually the first Wed of each month) beginning in September. We need to have your input in terms of title/subject now in order to book rooms and promote the series as a whole. You may present alone or with a partner. Fusion event 14 December – draft agenda now available! On the afternoon of the 14 December 2011 we will be launching the Fusion Seminar series with an event focused around launching the eight BU Research Themes. The event will combine time for cross-BU networking within these themes, with sessions led by theme champions focusing on defining the challenges in education, research & practice within each theme. You can register for the event and sign-up for the themes most relevant to you using the form below. Over the last decade, but particularly in the last five years, BU has matured into a university with a strong research track record with some of the most talented researchers anywhere in the world. It is a fantastic success story and one to be justifiably proud. 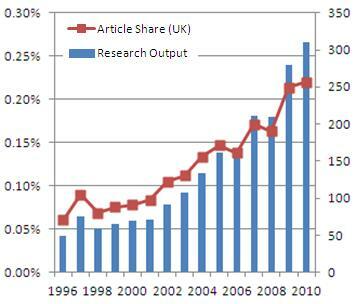 Take a look at the graph which shows the growth in our published output as depicted by Scopus data; it truly something! Our output has grown at a rate of over 13% compared to 3.7% for the UK as a whole. RAE2008 was a milestone in this journey – the fourth most improved University was the well-deserved headline! There is much to shout about but we also have to think carefully about how we can continue this trajectory building on this foundation. To do this we will need to find more income. Our research income per academic FTE remains modest at around £6.5k compared to a sector average of £50k per FTE. To grow our research base further we need to up our game. You may ask why? Well to make another step change and ensure that we are not just left in the stocks as a teaching-only university as the sector shifts in the coming years we need to grow our learning community of research students, research assistants and post-doctoral fellows which are the lifeblood of a successful research active university. To do this we will need to attract much more external research income. It is not, however, just a question of bidding more, but critically of increasing the quality of our bids and thereby our success rates. There are many reasons why a shift to a research culture driven by societal need is important, not least of which is to give something back as a public institution to society, but it is also important to ensure our ability to bid more successfully for funds in the future. Let me use my own career as an illustration. My first passion is glacial geology and I spent much of the 1990s studying the esoteric discipline of sediment transport in Arctic glaciers. It was a fantastic period in my life in which I was perpetually scraping together funds for my next field trip and never more at home than on some frozen glacier. Money was not easy to come by because in truth there was little funding available for such work, to be blunt it has little or no societal relevance. It was not until I joined BU in 2002 that I started to reinvent my research direction working for the first time in the field of contaminated land as an environmental geologist and starting to work first in Central America and then in Africa on aspects of human evolution. During this second part of my career my success rate with Research Councils increased three-fold, as did the total amount of research income I generated. In essence I shifted from a field with little societal relevance to one with huge value. My passion for research remains but is just directed slightly differently! At the heart of this story is the fact that I was able to transfer my skills as sedimentologist – someone who studies dirt – from one discipline to another. Within BU we have a lot of active and talented researchers some of whom are working in fields of societal importance but some whom are not, preferring to pursue their own, often narrow, research agenda. By shifting to a more societal focus for the majority of our research our ability to generate income and achieve societal impact is likely to be much greater and this is a shift that we need to make together over the next year or so. A shift which is something that is essential if we are to make BU2018 a reality. During the last year BU has been through a process of defining societal research themes and it is worth refreshing ourselves about this journey. The initial candidate set of themes was generated from a trawl of all the priority funding areas for all major research funding bodies (Research Councils, European Commission, major charities, etc). This list was debated and refined by the BU Professoriate and subject to an all staff survey, in which candidate themes where put to the public vote. The remaining ten themes were scoped out and defined and then whittled to eight earlier this year via debate on this blog. These are the research themes on which BU has chosen to focus its societal research effort. But crucially they are still up for debate, evolution and further discussion. To this end I recently invited all staff to an event on the 14 December 2011 at which the research themes will be scoped further and networks of researchers created. If you have not signed up yet I would encourage you to do so! 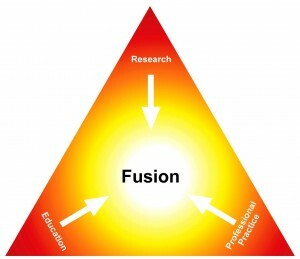 On the afternoon of the 14 December 2011 we will be launching the Fusion Seminar series with an event focused around launching the eight BU Research Themes. It would be great if you could hold this date within your calendars and register for the event. The event on the 14 December is the first in this programme and will focus on Fusion within the eight BU Research Themes. Following consultation these themes are now fixed as: (1) Health, Wellbeing & Aging; (2) Culture & Society; (3) Creative & Digital Economies; (4) Entrepreneurship & Economic Growth; (5) Environmental Change & Biodiversity; (6) Green Economy & Sustainability; (7) Leisure & Recreation; and (8) Technology & Design. The event will combine time for cross-BU networking within these themes, with some short keynote talks by theme champions focusing on defining the challenges in education, research & practice within each theme. We are still looking for one or more champions per theme to step forward and help shape the theme and also the event on the 14 December. Please get in touch with either myself or Julie Northam. Once we have all the speakers in place we will be back in touch with a full programme. You can register for the event and sign-up for the themes most relevant to you using the form below. It is important to register for the themes that interest you so that we can schedule the parallel sessions accordingly to avoid clashes! Starting later this term, the new BU Fusion Seminars aim to develop understanding within BU around the concept of Fusion, launched as part of the Vision & Values. The seminars, sponsored and led by UET, will be held monthly and aim to demonstrate examples of Fusion by highlighting instances of good practice at BU where education, research and professional practice have been successfully combined. The series will be launched on 14 December with a cross-BU conference focusing on Fusion and Society. The series will culminate on 18 April with a cross-BU conference focusing on Fusion in Action; this will replace the Education Enhancement Conference. In between there will be short monthly networking events, each focusing on specific examples of Fusion. Speakers will be nominated and invited by the University R&E Forum and the Education Enhancement Committees. 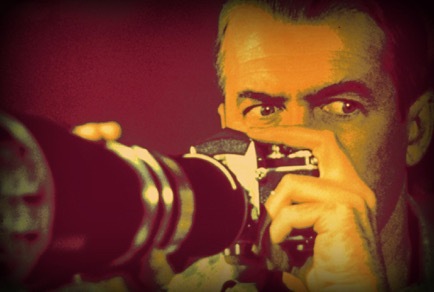 Booking for the seminars will open soon and furthr information will be available via the Blog shortly.